It's been about fifteen years since I first started carving. Among the first subjects I carved was a traditional red coated old world Santa. It was carved from a common 2x2 scrap of pine with a dull pocket knife. It was terribly crude, but it was enough to get me hooked on carving and lead me on an eventual path to my full time career. I've since gone on to carve all kinds of subject matter; presidents, circus people and vintage swimmers to name a few. Now, as the weather turns and the holiday season approaches, I always look forward to coming back to my traditional old world Santas. 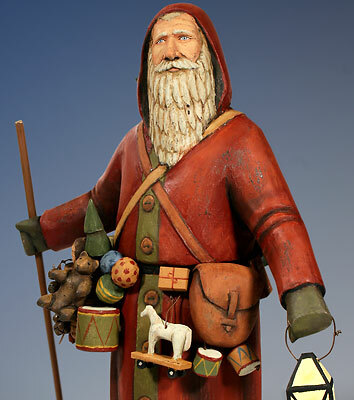 In this piece, he is cloaked in classic red and green, carrying a lantern in one hand and walking stick in the other. On one side he has a pack draped over his shoulder, the other side is loaded with a basket full of toys, dolls and other gifts. He also carries other presents around his waist and a bundled up Christmas tree on his back. His face has a look as though he has the upcoming long night's mission on his mind, but it is undoubtedly a mission that old St. Nick will be able to complete. He is carved from basswood, and painted with a multiple layer aged finish.